Made this one last night. Super delicious. It has a lot of great players: beer, cheese, hot dogs, spicy mustard and ketchup. How could you go wrong? Note: If you'd like, you can broil or saute your hot dogs first to give them an extra crispy skin. 1. Boil a large pot of water for macaroni. Salt water and under cook macaroni, cook about 7 minutes until just under al dente. 2. Preheat broiler and set rack 12 inches from heat. 3. While pasta works, heat a large deep nonstick skillet over medium-high heat. Add 1 tablespoon extra-virgin olive oil, 1 turn of the pan, then add hot dogs and brown on both sides, 4 minutes total. Remove the dogs with a slotted spoon to a paper towel lined plate. Add another tablespoon extra-virgin olive oil, 1 turn of the pan, and the butter. When butter melts, cook onions 4 to 5 minutes, then add flour and cook another minute. Add beer and cook off completely, 1 minute. Whisk in milk and bring to a bubble, then season the sauce with salt and pepper and stir in the mustard and ketchup. Lower heat and add 2 cups of the cheese. Stir to melt, 1 minute. Adjust mustard, ketchup, and salt and pepper, to your taste. 4. Drain pasta well. 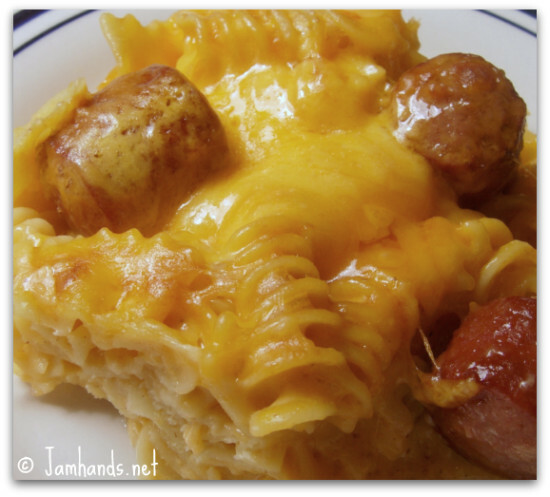 Combine pasta and hot dogs with sauce and coat evenly then pour into large casserole and top with remaining cheese. Melt and brown cheese under broiler, 2 minutes. Serve. Oooo I have made this before! It has all of my favorite stuff in it....this may need to be made this weekend! How funny! I'm planning on making this tomorrow night. I've never made it before but it sounds good. I think my kids will enjoy it. My name is Shannon and I'm the editorial assistant at Foodbuzz.com. Following up on a recent email invitation to be a part of our newly launched Foodbuzz Featured Publisher program, I just want to reiterate that the Foodbuzz team loves reading your posts and would be very excited to have you become a part of our blogging community. I would love to send you more details about the program, so if you are interested, please email me at Shannon@foodbuzz.com. Looks delicious and I can't wait to make it soon. Oh my....yummy in my tummy! made this tonight! everybody loves it!!! now i have just a little leftover ... this i'll keep for myself.